Cake Tasting at Honey Glaze Cakes ~ Mommy Meowmeow! Little E will soon be celebrating his first birthday and I can't seem to wrap my mind around this milestone. Like the say, ang bilis talaga ng panahon! :) Of course, Little Miss Z is joining on in the celebration for they share the same birth month. Since I only had a couple of months to prepare for this party, I tried to stick it out with our trusted suppliers but at the same time, I also wanted to explore other suppliers. I have contacted 2 other suppliers for this project but the other 2 did not reply anymore after seeing the cake inspo. I thought they were just too busy with Christmas orders so I inquired na rin with Honey Glaze. I really wasn't expecting it but they replied immediately! Di ba??? That's why ekis na the other 2 suppliers hehehe.. 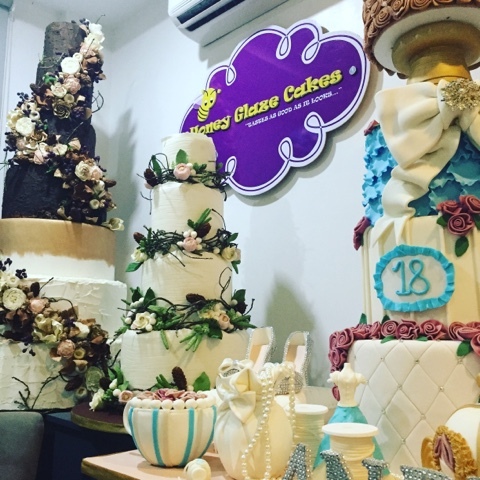 Since I 've heard nothing but GOOD feedback about Honey Glaze Cakes then we proceeded with our inquiry and booked a meeting and cake tasting with them immediately the day after Christmas. 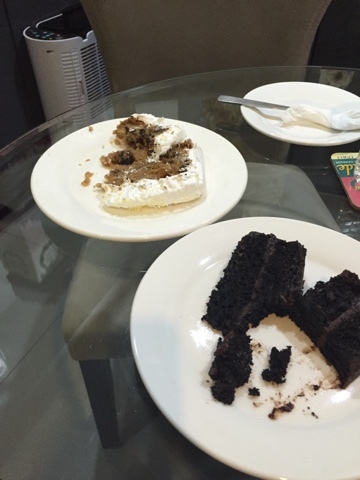 It was after all a spur of the moment inquiry and I told them it's okay if we will not have the cake tasting but what do you know, they immediately served the Belgian Chocolate Cake and Carrot Walnut Cake. No disrespect to the carrot cake (which was also very delectable) BUT BUT BUT the Belgian Chocolate Cake is indeed love love love!!!!! :D Aaaaahhhhh...You can see from the picture that they served two slices of each flavor and I mean it when I say I would've lapped it up immediately while Daddy A was busy fixing the car's parking hahahaha...*ssssshhhh!! * Okay, I didn't do that because #1 Dyahe, they have CCTV hahahaha and #2 somewhere deep in my conscience, I really wouldn't do that to Daddy A -- but I almost did! Huhuhu ...am I that bad? Hahaha.. It really is a clear winner and I probably stop sharing about the party cake details but YOU, should really try their Belgian Chocolate Cake when you have your next celebration.